Velvet is very difficult to work with! You can't use enough pins! (I also cut off some length on the sleeves). I turned the shirt around so the zipper closure was in the front, finished my raw edges and called it a day. (It was actually quite a challenge.... #VelvetSucks). If you'd like to see EVERY step (and there were a lot) in this refashion or WHY I called it "The Nose Strikes Again" top... feel free to see the post on my blog. I found velvet to be a bit tricky when I worked with it too. 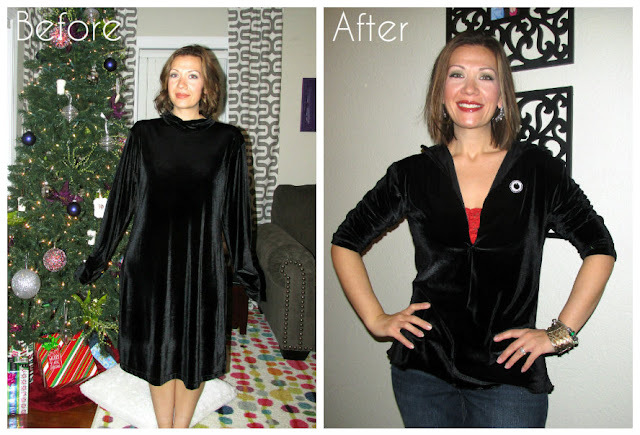 (Perhaps that's why I haven't refashioned anything velvet since...) Your top looks great though! Good job! Lol ... Love the hashtag #velvetsucks. I love the refashion. Thanks girls :) I appreciate it!